This article will guide you on how to use the 5 GHz wireless band on your Linksys Wireless-N router. The less crowded 5 GHz wireless band offers significantly improved performance over the more common 2.4 GHz wireless band for time-sensitive music, video streaming or gaming. To find out the difference between connecting to 5 GHz and 2.4 GHz bands, click here. QUICK TIP: Using the supplied Setup CD to install your Linksys E2000 router, the Linksys Connect software will automatically choose the 2.4 GHz wireless band configuration by default. 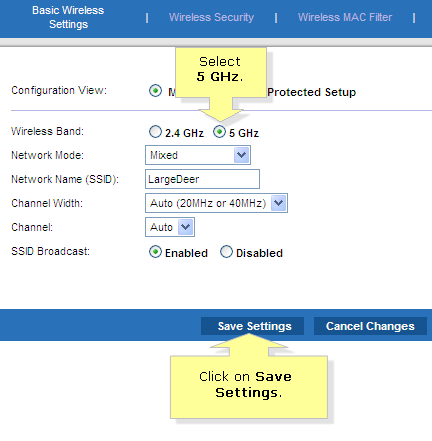 NOTE: If you prefer to use the 5 GHz wireless band, you can manually switch to this configuration via the Linksys E2000's web-based setup page. Your Linksys E2000 must already be properly installed. This procedure must be performed on a computer that is currently connected to your router, and must already have Linksys Connect software installed. If you are using a wireless laptop to perform this procedure, make sure that it is currently connected to your router’s wireless network. Ensure that your wireless adapters and devices have 5 GHz wireless capability in order to use the 5 GHz frequency range. Your computer’s wireless adapter needs to be compatible with -A,-B,-G,-N or -A,-G,-N wireless standards to be able to detect the 5 GHz network. To learn how to check if your computer can detect the 5 GHz network, click here. Launch Linksys Connect software on the computer directly connected to your router. Click Router settings. NOTE: To launch Linksys Connect using a Windows computer, go to Start > All Programs > Linksys Connect. To launch Linksys Connect on a Mac computer, navigate to the Applications folder in Go, and then start Linksys Connect. If you need more help, click here. If you don’t have Linksys Connect installed, click here to access the web-based setup page. Proceed to Step 4 once the web-based setup page opens. NOTE: To learn how to launch the Linksys Connect software on a Windows or Mac computer, click here. Under the Other options category, click Advanced Settings. On the Advanced settings window, your router’s username and password will appear. Once you have taken note of these credentials, click OK. NOTE: You may also click on Copy password to temporarily copy the username and password. 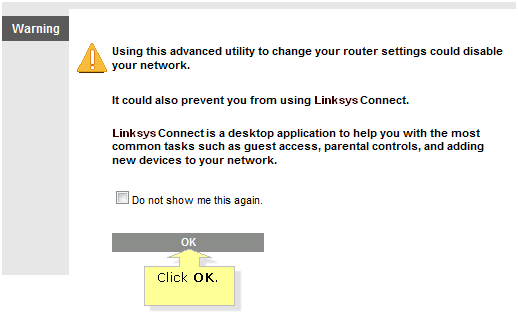 NOTE: A prompt will appear, informing you that any router changes using the web-based setup page will prevent you from using Linksys Connect software. Click OK to continue. On the router’s web-based setup page, click on the Wireless tab. 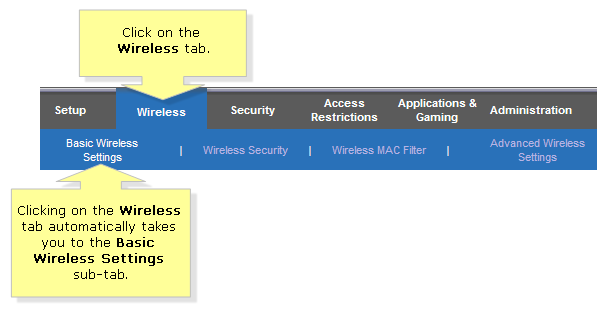 It will take you automatically to the Basic Wireless Settings sub-tab. Look for Configuration View and select Manual. This will open the detailed configuration of your network. Select 5 GHz and click Save Settings. NOTE: Notice that the same Network Name (SSID) has been assigned for both 2.4 GHz and 5 GHz wireless band configurations. You will receive a confirmation that Your configuration changes have been set. Click Continue. The page will go back to Basic Wireless Settings. NOTE: Linksys Connect will automatically reconnect your computer to your wireless network after you switch to the 5 GHz wireless band provided that your wireless computers have 5 GHz adapters and the wireless settings were not changed. However, if you had changed the wireless settings for the 5 GHz network, you need to reconnect to the network. To learn how, click here.